Multi Boxes are unique mini boxes that can be used to package a wide variety of products from the cutting tool industry to the hobby and craft market. These Mini plastic hinged boxes are just the right size to package grinding disks, diamond wheels, ceramic inserts, circular saw blades and side & face milling cutters. The optional custom cut-to-order foam inserts safely hold valuable/delicate items for the most secure and functional presentation. Optional plastic labels and direct printing add informational branding and logo recognition for value added advertising. Universal use Multi Boxes are excellent for consumer and retail packaging applications for hobby, craft, office supply, hardware, medical, dental, electrical, fishing, hunting, laboratory and many more. 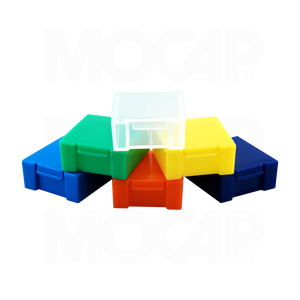 Multi Boxes are available in transparent Polypropylene (PP) which is 100% recyclable. Additional colours available.